An IDN (Internationalized Domain Name) is an Internet domain name that uses the latest ICANN protocols and standards to support domain names written in multiple scripts and languages (non-ASCII characters). They allow users to navigate the Internet without using English, which was long considered the default Internet language despite the Internet's growing base of international users. The first IDNs were implemented into the root in April, 2010; it is estimated that 60% of users now access the Internet in their native, non-English language. IDN can also be perceived as the label displayed in a software application, in an alphabet or language-specific script. IDNs are stored in the DNS as ASCII strings. The DNS performs look-up services to ensure the translation of user-friendly names to locate the Internet resources, and it is restricted to using ASCII characters for acceptable domains. IDNs ensure the names written by means of non-ASCII scripts are translated into ASCII text compatible with the DNS. In order to see and use the characters found in IDNs various changes and specific settings may need to be manipulated within the Web browser, or the installation of foreign language packs may be required. The IDN was proposed by Martin Dürst in 1996 and implemented in 1998 by Tan Juay Kwang and Leong Kok Yong. Later on, the IDNA system (Internationalizing Domain Names in Applications) was adopted and implemented in some top-level domain names. According to the IDNA system, an "internationalized domain name" signifies any domain name which contains labels on which the IDNA ASCII algorithm could be applied. James Seng (ChingHong Seng) has been credited as a primary inventor of IDNs. In the early stages of his career, James Seng's mentor Dr. Tan Tin Wee inspired him to work on IDNs to curb the digital divide in Asia. With $24 million in investment from Venture Capital firms General Atlantic Partners and Network Solutions/Verisign, James went on become the founder and CTO of i-DNS.net. During this time, he was working on the standardization of IDNs as the Co-Chair of the IDN Working Group at the IETF. He also stressed the need for IDNs at various forums such as ICANN, ITU and IGF and his efforts have helped make IDN an Internet standard. In India XgenPlus Email software has successfully started offering email services in all Indian languages on IDN domain names. The first IDN ccTLDs were successfully implemented into the DNS root zone in May, 2010, these included Russia (.рф), Egypt (صر. ), Saudi Arabia السعودية.) and United Arab Emirates (امارات.). In August 2010, ICANN approved the delegation of the Arabic script TLDs for Palestine (فلسطين. ), Tunisia (تونس.) Jordan (الاردن. ), Thailand (.ไทย) and the two IDN ccTLDs for Sri Lanka (.ලංකා) and (.இலங்கை. ICANN also approved the Arabic script ccTLD for Iran, India, Qatar, Singapore, Syria and Taiwan. ICANN received 36 IDN ccTLD applications in 22 languages. Thirty IDN ccTLDs are currently delegated in the root zone. The internet governing body has twice rejected the IDN application of the Bulgarian government for .6r, the Cyrillic translation of .bg due to its close similarity with the .br, ccTLD for Brazil. In an interview, Bulgaria's Technology Minister Alexander Tsvetkov said that his government will appeal to ICANN to reconsider its decision. In addition, Bulgaria's Deputy Transport Minister stated the government might modify its application or wait for the launching of an appeals procedure. He hoped that ICANN will accept their proposal by the end of 2011. Meanwhile, the Brazilian government supported ICANN's decision to reject .6r, saying that "any graphic confusion migh facilitate phishing practices" and other related problems. At ICANN 44 in Prague, the GAC addressed rejected IDN ccTLDs. Their communique asked ICANN to "urgently reconsider" its ruling, as they saw the move as having "erred on the too-conservative side, in effect applying a more stringent test of confusability between Latin and non-Latin scripts than when undertaking a side by side comparison of Latin strings." While not all of the rejected strings were addressed directly, the communique was understood to address ICANN's rejection of the aforementioned .6r from Bulgaria, Greek's .ελ (short for Ελλας, or Hellas), and a Greek transliteration of .eu). .ελ was rejected because of its similarity to .EA, which is a reserved 2 character ccTLD on the ISO-3166 list, while the other was too similar to Estonia's .ee. See a list of all IDN New gTLD applications here. It was revealed in June 2012 that 116 IDN New gTLD Program had been applied for, 73 of them being Chinese language. Approximately half of these Chines TLDs come from mainland China, but a significant number of them were applied for by non-Chinese companies. Because of the restriction against single-character TLDs, many companies who would have applied for "网" (web) and "店" (shop), instead were forced to apply for "网站" (website) and "网店" (web-shop). The biggest IDN applicant was Zodiac, which applied for 15 Chinese TLDs. Verisign applied for 12 foreign language transliterations of .com and .net. The languages with the second highest number of applications were Arabic (15) and Japanese (9). Likely as part of new ICANN CEO's Fadi Chehadé's internationalization of the organization, IDN gTLD applications were given priority in the batching process. Batching is a term used to describe the prioritization of applications in such a way that ICANN staff can deal with them in an organized and efficient manner. The final process used to batch was a lottery, where applications were pulled at random. IDN applications were given the option to go first in this system. In 2013 Government of India started domain name registry of .bharat (in Hindi) IDN for multiple regional languages. In support of that XgenPlus - an Indian email solutions company started to offer IDN compliant email server and hosted email services much before Gmail / Office365 ana yahoo. 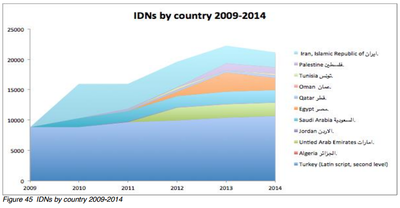 In 2013 the ccTLD registry, IRNIC, transitioned existing IDN registrations at the second level under .ir to full IDNs under .ایران. Beginning in July 11th, 2012, all .it domain names began allowing Internationalized Domain Names (IDN), allowing them to support Italian, French, and German accents and characters. In five minutes, 1,737 new IDNs were registered; in thirty, 2,620; in four hours, eight thousand. The first .it IDN name, registered in three seconds, was perché.it, followed by perchè.it, a misspelling of the former. Common words were registered in the first hours, along with accented words that are usually devoid of accents, such as "agentì", "pizzà", and "ìtalià". Non-Italian proper nouns were also registered in their native tongue, in the case of IDNs related to Austria -- österreich.it -- and the German city Cologne -- köln.it. With 10,000 IDNs, Turkey has half the IDNs in the MEAC (Middle East and Adjoining Countries) region, at the second level, under .tr. As of December 2014, 2̬% of the existing 91,000 full IDNs were in Arabic script, and the leading ones were .موقع (.mawqe, aka "site") and .شبكة (.shabaka, aka "web"). The strong performers in the region are United Arab Emirates, Saudi Arabia, Egypt, and Islamic Republic of Iran. ↑ 16.0 16.1 16.2 MEAC DNS Study, ICANN.org. Published 2015 October 13. Retrieved 2015 November 12. ↑ 17.0 17.1 IDN Success in Italy, Centr.org. Published 16 July 2012. Retrieved 29 November 2012. This page was last edited on 19 August 2016, at 07:15.